Click play button below to watch the trailer. Click here for iPhone video file of the Platonic Solid Rock Trailer. Click play button below to watch the entire movie. 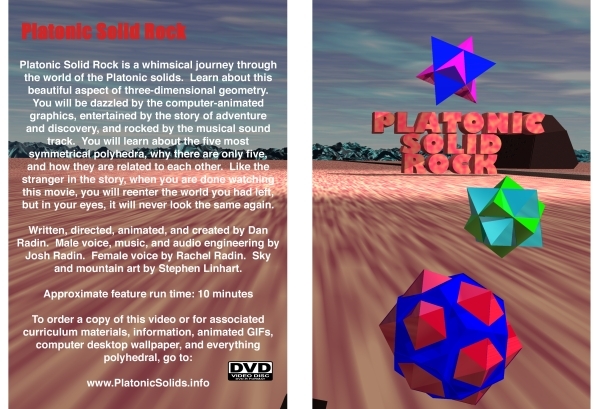 Click here for iPhone video file of the entire Platonic Solid Rock Movie. Why buy the DVD when you can watch it for free on TeacherTube? You can play it on any system that has a DVD player. You will enjoy the better sound and video quality. You can use custom menus to jump to specific topics for classroom instruction. You will have greater control for pausing and playing back in slow motion. You can take it with you to places that have no Internet. You will be supporting an entrepreneur to do more creative educational work. You can enhance the look of your video collection with the beautifully printed package. You will have to think of the last reason so I can show off another animated GIF. Click on the links below to order your own copy of the DVD!